As every Jew across the world knows, there is always an oven waiting – not at Lowe’s, not at the pizza place down the block – but at some camp where they don’t play volleyball, they just play it like a death match. The Citizen just isn’t interested in getting that tanned. He also isn’t interested in eating pastrami to the point of no return or to the point the scale goes past 400 pounds. Or is he interested anymore in playing cards with nudniks (pestering, irritating people in Yiddush), who sit and eat potato chips by the bag and take his money like it was manna from Heaven. Still, there’s always some Jew who’s headed on the way to baking – and not matzahs – like some related to the President-Elect that The Citizen look to as not the canary, but the Jew in the coal mine. 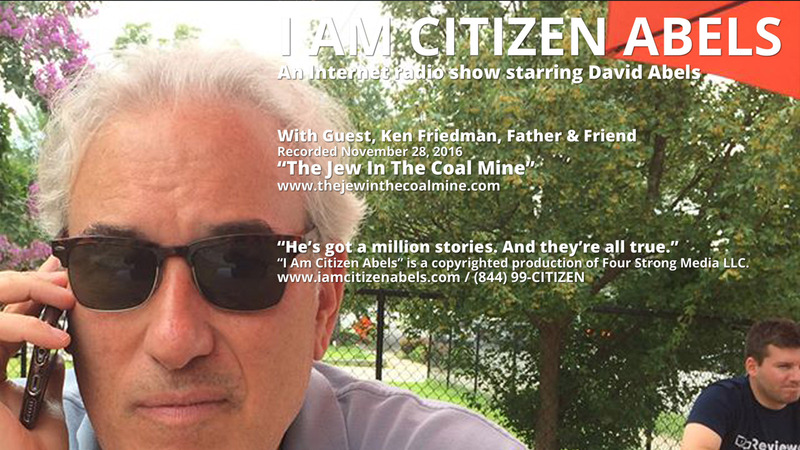 In this episode of “I Am Citizen Abels,” recorded November 28, 2016, The Citizen goes into the post to face off in a basketball game of words with his old very good-looking friend and former coworker, Ken Friedman, the nudnik in chief at local card games and kosher eating faceoffs. Ken’s memory suddenly goes blank when The Citizen mentions his former employer – Israeli shipping company, Zim - whose shipping containers contain various items that we obviously just don’t talk about. And Harry, Ken’s 18-year-old son who was shipped in a container off to Israel – well, that’s another topic that irritates The Citizen and his old friend to no end. So join in the fun with one of The Citizen’s favorite Hebrews as they discuss why Ivanka’s orthodox Jewish husband could be a turncoat or “The Jew In The Coal Mine". Just remember after the show to put on your pants before sunset. Oy!